Blowout Sale! 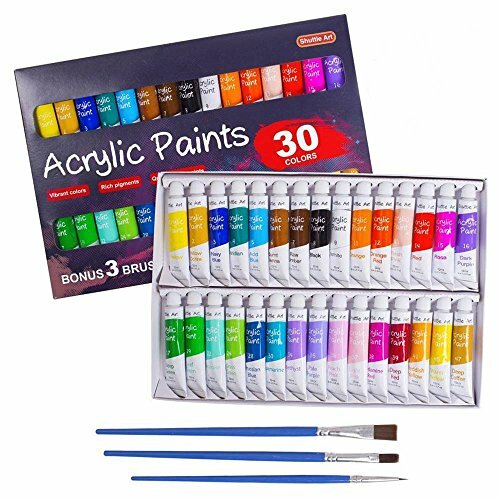 Save 51% on the Acrylic Paint Set, Shuttle Art 30 x12ml Tubes Artist Quality Non Toxic Rich Pigments Colors Great for Kids Adults Professional Painting on Canvas Wood Clay Fabric Ceramic Crafts by Shuttle Art at Community Frontiers. MPN: AP-30. Hurry! Limited time offer. Offer valid only while supplies last. Shuttle Art 30 colors Premium Acrylic Paint SetColors names and numbers are printed on every tube making every paint distinguishable from another. Colors names and numbers are printed on every tube making every paint distinguishable from another. Each tube is 3.54 inches high, has 12ml (0.4oz.) capacity, and filled with high quality, rich creamy pigments. Pigments are stored in aluminum tubes to guarantee maximum freshness and are durable, non-toxic and odorless. When stored properly, acrylic paints can last for years. Ideal for children, teens and adults whether you are a beginner or professional artist. Perfect for painting on canvas, ceramic, wood, fabric, clay, walls, nails, crafts and some other surfaces. Acrylic paint is easy to clean up after use (before drying) with warm soapy water. The inner tray is made from thick cardboard , unlike others who use cheap thin PVC trays. Our storage tray is perfect for long term storage without drying out your paints or until you've used them all unlike other brands which often get thrown out due to improper storage and non aluminum tubes which cause paints to dry out. Acrylic Paints can dry out easily if not stored properly, remember to cap them after use and keep them out of sunlight & high temperature when they are stored. Don’t expose your artwork or acrylic paints in direct sunlight. Compared to other coloring products, acrylic paints are more versatile. They can not only work on canvas, but also on many other surfaces. Apart from other working mediums, your work can be kept for a lifetime with waterproof and fade proof characteristics of acrylics and proper display of your work. All our acrylic paints are formulated to comply with all US and European safety standards:U.S. ASTM D-4236 & EU EN71 . VIBRANT ACRYLIC PAINTS: Shuttle Art 30 Acrylic Paint Set consists of 30 vibrant assorted colors and with BONUS 3 FREE PAINT BRUSHES. Each tube is filled with 12 ml (0.4 oz) paints with rich pigments that are professional artist quality. VERSATILE PAINTS: Paint lay down is creamy and vivid. Great for teens, beginners or artists for wide range of surfaces, such as canvas, ceramic, wood, fabric, clay, walls, nails, crafts and more. Children use acrylic paints in art class and leisure time to develop imagination skills and adults paint to relax and boost creativity, great for creating decorative art for your home. DURABLE PAINTS: Acrylics dry very quickly. Paint stays on surface extremely well and is durable and long lasting. It's permanent, waterproof and fade-proof. HIGH QUALITY THICK PIGMENTS: When acrylic pigments are thin, artwork will appear watery and difficult to achieve vibrancy. We have developed a thick and rich pigment that provides superior coverage and maintain smoothness while painting. SECURITY ASSURANCE: Conforms to U.S. ASTM D-4236 & EU EN71. It's safe and suitable for all ages. 100% SATISFACTION GUARANTEE and BETTER THAN MONEY BACK SERVICE. Take action and get yours now! If you have any questions about this product by Shuttle Art, contact us by completing and submitting the form below. If you are looking for a specif part number, please include it with your message.